Darkest before dawn: What’s going on with crypto markets, and where are we headed? What caused the crypto market to dump? Will it recover and what should be our hopes and fears? These questions have been haunting the crypto community since June when it first became clear: major currencies are not doing very well. Read our market research if you are also looking for the answers. 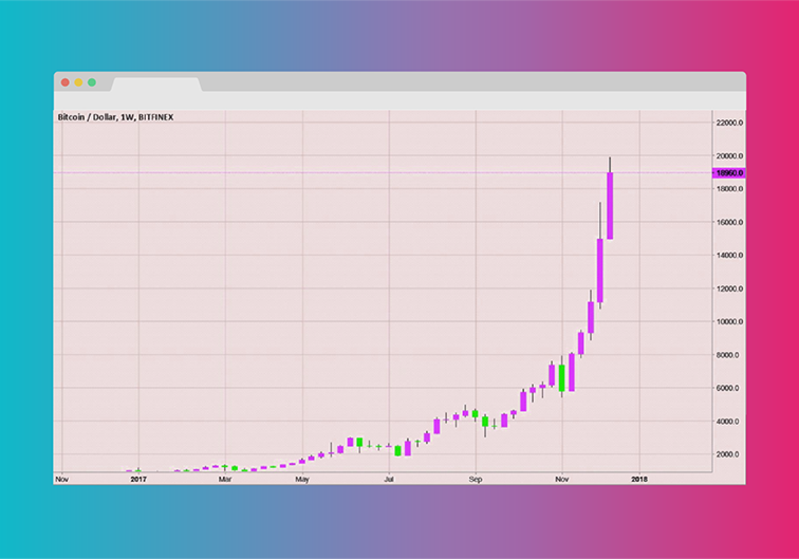 Since the middle of 2017, cryptocurrency pricing dynamics has been the focus of mass media attention. Remember numerous provocative articles on the few winners in the crypto industry getting “hilariously rich”, or stories on teenager Bitcoin millionaires? 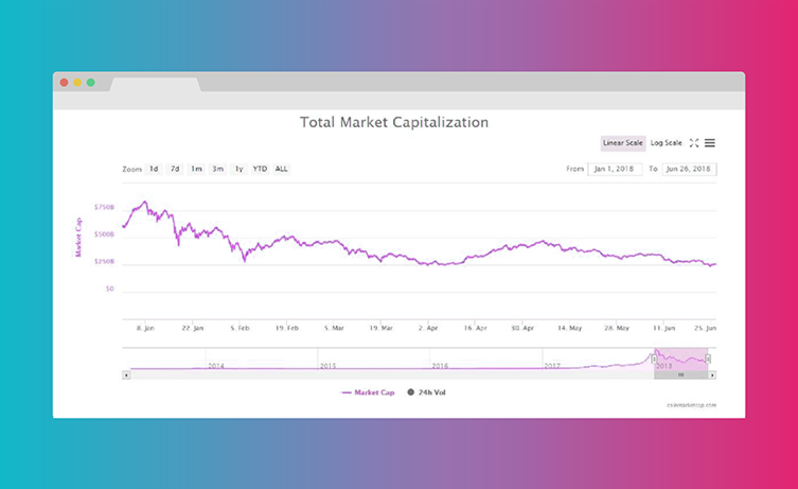 The initial scepticism of large media outlets has been quickly turning into optimism: CNBC even held live streams that explained how to buy crypto and what to do with it. Each article or even headline has probably contributed to this fear of missing out on opportunities, hasn’t it? Against this backdrop, many people started investing into cryptocurrencies. Driven by the hope to get some “easy money”, inexperienced investors flooded the market and boosted its capitalization. Just last Autumn, you could go and buy pretty much any liquid coin or token and expect a parabolic growth. Over the period of July 2017 — January 2018, total market capitalization grew almost 10 times reaching 20 089 USD on December, 17.. Being rational, would you buy that? Of course not — but back then, your opinion could be clouded by all the mass euphoria. Even tokens that had absolutely no utility and were intended as an inside joke managed to show a 10x growth over December and January. A good example is the one specifically called Useless Ethereum Token, whose capitalization grew from $20,000 to $350,000 in December 14 — January 14. Regulators from the leading countries have been discussing crypto all year, yet very few have managed to work out a clear-cut view on digital assets. Announcements from SEC were particularly awaited but the U.S. regulator only resorted to taking measures against separate crypto-related projects without providing clear guidelines. At G20, representatives of numerous countries discussed the possible uses of the technology, yet their overall attitude towards cryptocurrencies was neutral at best. Asia, one of the largest cryptocurrency markets in the world, has turned crypto market into a bloodbath several times by introducing unexpected bans on ICOs and/or cryptocurrency trading. On the other hand, this region also contains examples of the clearest regulatory measures taken by the state towards cryptocurrencies. In 2016, Japan became the first country to recognize digital currencies as money. The Bitcoin futures market let institutional traders into the world of cryptocurrencies. While this was widely regarded as good news, some also feared the new instruments would allow to short sell positions on the officially regulated market without openly engaging the semi-legal asset that was Bitcoin. It was common knowledge that Bitcoin would eventually start falling, yet the exact moment was only known to the mysterious “whales” — those who had amassed enough Bitcoin to influence the market. How did they decide when exactly to lock in their profits? We have our assumptions — frighteningly precise ones at that — but we will touch upon them a bit later. Quick growth most often leads to rapid decline — this rule works for any asset on the market,and is especially true for those with no real reason to grow in value. Bitcoin is no exception: market correction was to happen as traders were willing to lock in their profits and create new market cycles. This is exactly what we have been witnessing since the start of the year, as cryptocurrency values have gone down multiple times. The minimum market capitalization was 235 331 000 000 USD on June 18. Traders and investors have been stressed-out since January, and the given pricing dynamics has pushed impatient ones out of the market. Trading volumes are also falling on all exchanges, which is obviously a negative factor. However, we don’t see the hidden OTC trades — and those are rumored to be massive. The ICO boom is still going strong: over the first 5 months of 2018, a total sum of $9.8 billion was raised by ICOs. More and more projects appear on the market — but at the same time, the amount of money for capitalization is decreasing. Investors’ money is getting diffused, primarily due to the willingness to make money from tokens getting listed on exchanges by doing a quick flip. By this point, you might have turned pessimistic after reading all this. Don’t be just yet. Despite this decline, we still see the fundamental market sentiment as positive. President of China has called the blockchain technology promising, while head of SEC has ruled that the current blockchain transactions are not security ones, thus eliminating a considerable regulatory threat for the market. Said market is just about to reach maturity, as mainnets for many large projects are scheduled to be launched this summer. Moreover, with the availability of custody service one of the obstacles for the institutional presence on the market has been eliminated. Coinbase Custody recently announced the acceptance of the first deposit. The purpose of the service is to make investing in the digital currency accessible to world-class financial institutions and hedge funds. Most of the investors who entered the market relatively late (after the 3k-5k mark) will get “washed out”. When Bitcoin reached the 4k mark, the number of active addresses skyrocketed by over 50%: 700,000 to 1,100,000 over 3 months. After the sharp price fall, that amount decreased to 550,000 — the October 2016 level. A huge amount of ICOs that appeared in 2017 will be reassessed. It will no longer be possible for an ICO to survive on promises alone: it will also have to show an actual product and positive dynamics to stay afloat. Emerging projects of 2018–2019 will set the bar much higher by offering a relatively finished product and a well-thought strategy. The competition will grow much stronger since many projects will aim to solve the same problems. Just like the dotcom market, this one will eliminate all “money grabs”. Many projects will cease to exist, so it is high time you considered the fundamental value of your holdings. Ask yourself a question: what additional value will this token or service bring? Bitcoin is and will remain the foundation — the king of crypto, if you will. It is the only truly decentralized and leaderless cryptocurrency in existence. There is no man to arrest and no company to close, so it cannot be stopped. The hash power that is used to secure the Bitcoin network is unmatched. In order to take control over the BTC blockchain, one must have 51% hashrate. The financial cost of energy is higher than the money that can be gained by overtaking. The often-cited argument that Bitcoin is slow and not modern enough doesn’t hold either. Fast payments are coming with the Lightning Network, smart contracts with Rootstock, side chains with Drivechains, privacy with MimbleWimble and Schnorr signatures. Now to the most exciting issue of market capitalization and finding the points to lock in your profit. 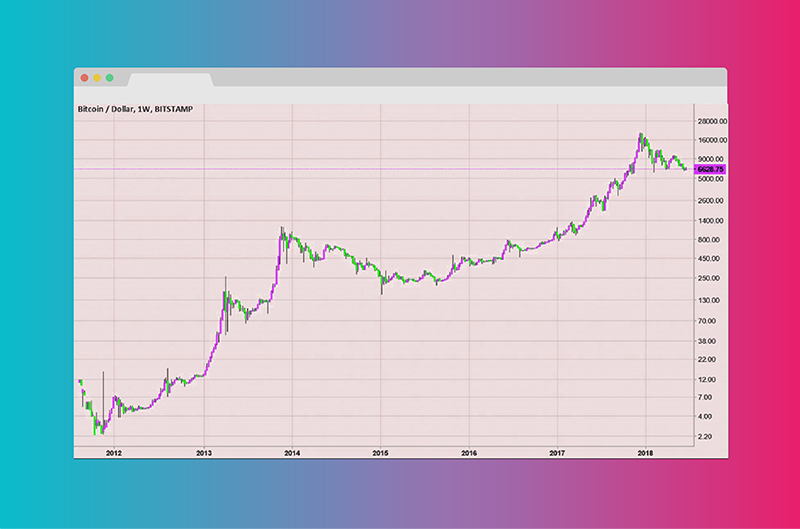 Below, you can see the BTC graph since 2012 on a logarithmic scale. You can clearly view all the trends that happened during the periods of the asset’s significant price disparity. The two lines show the support and resistance levels that have been in place since 2012. They perfectly coincide with the current pricing dynamics. Each point on the price graph that is crossed by a line represents “smart money moves” that define the further pricing dynamics. These points are the basis of the support and resistance level trends within the given timespan. The green line signifies the trend that had acted as a support level before it got broken; since then, it has been the resistance level. 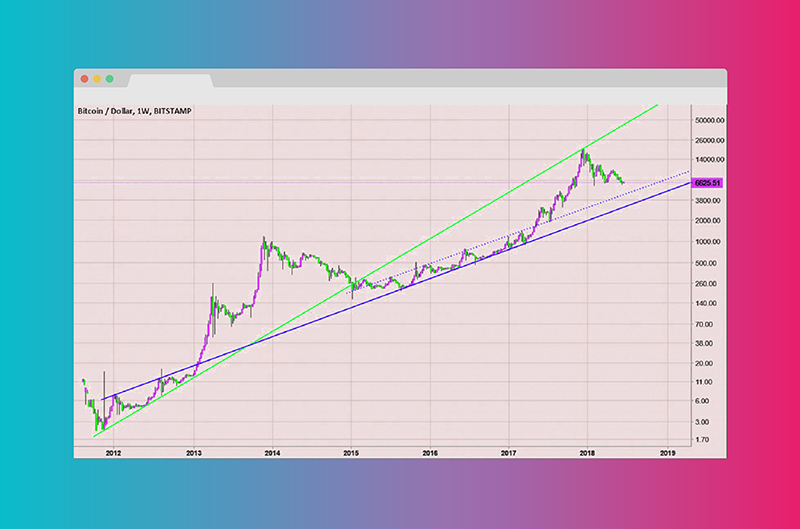 As shown on the graph, the price reached the resistance level in December 2017 but couldn’t break it (another “smart money move” point), which was the signal for traders to start locking in their profits. Judging by the graph and the current state of the market, Bitcoin support levels reside at the $3,000 and $5,000 marks (the solid and punctured green lines). Regulatory issues will continue to emerge. They will most probably be reviewed on a global level since the Bitcoin phenomenon equally concerns all countries with Internet access. Thus, we are likely to witness global regulatory plans and solutions, not just local ones. Market capitalization will gradually shift towards projects with higher ROI. Dapp platforms for decentralized app development have fallen out of favor; the new trend is presented by infrastructural protocols — a specialized software environment allowing to bring different chain types together. An example of such a protocol is Wanchain integration with ETH and BTC. Tokens are much more convenient than any other form of data storage. Even company shares can be tokenized via security tokens. The platform to conduct ISTO (Initial Security Tokens Offering) instead of IPO is already in development. Such a market will likely exceed the traditional one by capitalization, as it will be completely regulated and able to define all the basic aspects of shares handling. Essentially, company shares will be digitalized, while transactions will remain unaltered.